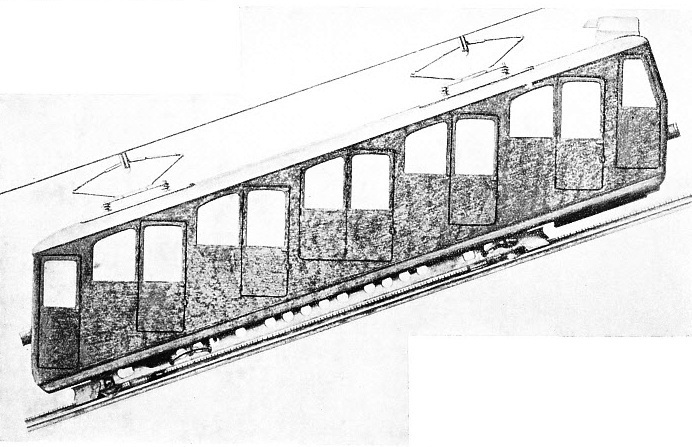 ROLLING STOCK for the Pilatus Line has the compartments built out of plumb, so that they will be comfortable when travelling on a gradient as steep as 1 in 2. The steam coaches, which were superseded on the electrification of the line, were divided into four compartments, with a driving cabin at the lower end. Each coach accommodated thirty-two passengers and weighed 10½ tons. FOR more than a century Lucerne has attracted visitors to Switzerland, and mountain climbers have braved the perils of the peak that overshadows the town - the grim and rugged Pilatus. The highest peak of Pilatus, the Tomlishorn, stands 6,998 feet above the level of the sea. The ascent of the mountain, even in ideal weather conditions, was regarded as a wonderful feat capable of accomplishment only by the hardiest and most experienced of mountaineers. When a proposal was first made in Lucerne to build a railway to the summit of Pilatus, the scheme was resided as utterly impracticable, even by the townspeople whose interests would he served best by such an undertaking. Once the idea had been formulated, however, the project was never abandoned, and in December 1885 plans far the proposed railway were laid before public by two highly skilled engineers, Colonel Edward Locher and Mr. E. Guyer-Ereuler of Zurich. To Colonel Locher we owe the famous Locher rack-rail system which permits a train to crawl, fly-fashion, up the precipitous side of a mountain. Colonel Locher’s invention was specially devised for this amazing railway, where any other form of rack rail would have been of no avail. Mr. E. Guyer-Freuler brought to the partnership his genius as an engineer with a wonderful experience in the building of mountain railways. Some of the most difficult sections of the famous St. Gotthard line in Switzerland were built under his guidance. Despite considerable opposition these two men were able to form a company, and work on the great undertaking was begun in the summer of 1886. It was decided to attack Pilatus on its southern flank, and the objective chosen was the mountain’s second highest peak, the Esel, which rises to 6,965 feet. The railway terminus at Alpnach, on Lake Lucerne, is 1,447 feet above sea level, but the railway climbs up to a height of 6,791 feet - a difference of 5,344 feet to be climbed by a railway only 5,049 yards, or less than three miles, long. The gradients alone were different from anything that had been encountered in any other part of the world. The easiest grade on the Pilatus Railway is a rise of 1 in 5. A gradient of 1 in 50 is considered exceptionally steep on an ordinary railway. The average grade on the Pilatus line is a rise of 1 in 2·8, and even this astonishing figure is exceeded in places where the track rises one foot for every two feet of its length. That kind of slope is not easy even to stand on; but, as building materials had to be hauled into position and track-laying operations comprised the daily task, the steepness of the declivity must have been one of the most difficult problems of all. It was impracticable to run the line in a spiral and use easier gradients because of the additional cost of the track and because of the time required not only for the building but also for the journey between the lake and the summit. The engineers knew the capabilities of their new rack-rail system and decided on a frontal attack straight up the mountain. They planned their line along the shortest possible route, but they had to pay for their insistence. The mighty chasms that split downward to the heart of the mountain had to be bridged. ON THE WAY TO THE SUMMIT magnificent views of Lake Lucerne and the surrounding country can be obtained from the Pilatus Railway. When the train has climbed the Risleten, the slope at the base of the mountain, the Obwalden Valley comes into view. 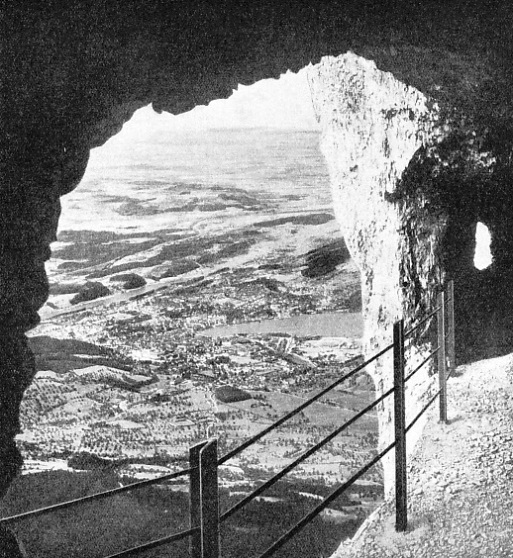 The vast overhanging promontories of Pilatus presented obstacles of solid rock through which the drills and blasting powder of the tunnellers drove their inexorable way. There are several tunnels, four of which are in the highest section of the line. The gauge chosen for the track was 2 ft 7½ in. Scarcely any part of this great work appears to have been carried out on conventional lines. New methods had to be devised to cope with conditions as the engineers found them. When building an ordinary railway the track is kept level by cutting through the hills and filling in the valley. Cuttings and embankments then carry the track without further difficulty. But Pilatus demanded more than track laying. The whole steel line is anchored to a continuous wall, built and cemented to the mountainside stone by stone and topped with large granite slabs brought to the site from the little town of Osogna, some distance south of the St. Gotthard Pass. This stone wall climbs up the mountainside with the least possible amount of curving and crosses the various ravines on massive arches of masonry. Such were the methods adopted in overcoming the mountain’s resistance to man’s endeavours, but weather conditions also called for the utmost care in planning the construction Most of the contractors’ men were Italians, mountaineers who were skilled in carrying out constructional work at high altitudes. Even so, plans that had been made on starting work at daybreak had frequently to be changed by noon. A storm on the heights of Pilatus can test the hardiest of mountaineers. Gusts of wind swirl wildly from all directions, making a scant foothold even more precarious, and in winter the falling snow forms a blanket that obliterates all sight of the surrounding land. Thunderstorms, too, provide in full measure a display of Nature’s might, as the gathering clouds discharge and take up static electricity from the whole surface of the mountain. The thunder crashes first from one side then from another, giving the effect of volley firing on some great battlefield. Weather conditions made it impossible to work all the year round on Pilatus. With the approach of autumn, work had to be suspended for six months, except in the tunnels. The contractors provided their workmen with food, lodging and medical attention. Huts built far up on the mountainside were provided with provisions and medical supplies as a precaution against the enforced isolation of working parties during periods of storm or fog. The building of the Pilatus Railway may be compared with the growth of a wall plant climbing steadily from the ground. Foot by foot the massive stone wall was advanced towards the summit of the mountain. As the wall was completed the topmost layer of granite slabs was placed in position. Then followed the bolting down of the running rails and the steel central rack with its teeth on either side cut from the solid metal. As the line progressed so were supplies brought along it to the railhead. From there to the workmen in what may be described as the advanced positions, materials were transported on the backs of mules, sure-footed pack animals accustomed to climbing tortuous mountain tracks and paths. The steeply-sloping wall of masonry presented difficulty enough, but the ravines provided an even sterner test of the engineer’s skill and resources. The spanning of these clefts in the mountain necessitated, first of all, the building of temporary wooden bridges or “falsework” on which the stone arches were built up stone by stone and firmly cemented together. The ends of the arches were carried down to the solid rock on either side of the gorge. These stone bridges were built of a width sufficient only to carry the track. To provide a pathway for the maintenance staff, engaged in the important duties of inspecting and repairing the track, strong brackets were built into the masonry on either side of the bridges. Wooden platforms with a handrail were then erected on the brackets. Those narrow sloping platforms, poised hundreds of feet in mid air, must provide an exacting nerve test for the man whose duty it is to maintain the permanent way in perfect condition. The platforms are not confined to bridges - they are to be found on the “off” side of the track that hugs the mountainside. In such places the line runs along a narrow ledge cut and blasted from the rocky flank of the mountain. The wooden platforms then overhang a sheer precipice, and they slope so steeply that cross battens are nailed to the planking as in the gangplanks which link ship with shore in dock. It seems incredible when travelling on this marvellous line that men could have cut these steeply sloping ledges from the face of the mountain. Despite all difficulties, however, the railway builders pushed the steel track ever higher towards the summit. After about 400 working days the upper terminus was established at Pilatus-Kulm, close to the Esel and under the shadow of the mighty Tomlishorn. The cost of the railway was 1,900,000 francs, or £76,000. 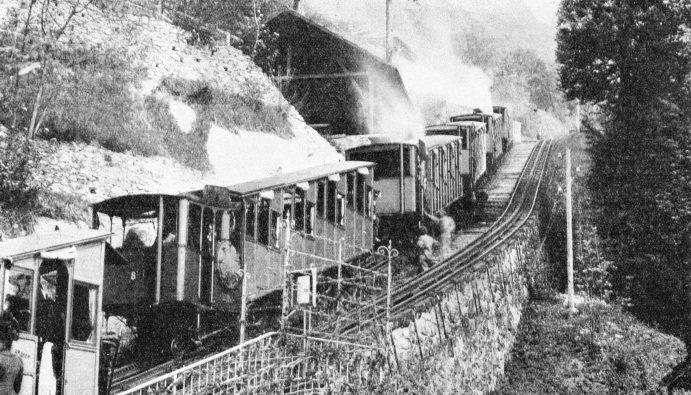 The first passenger train ascended Pilatus on August 17, 1888, and a meeting of directors was held at the mountain top. The proceedings were enlivened by an impromptu concert in which the work-men participated, and the occasion was celebrated by a display of fireworks. This was followed by an unrehearsed and particularly violent thunderstorm. The special rack-rail system devised by Colonel Locher met the exacting requirements of the Pilatus Railway. In most rack-rail systems the teeth of the rack point in an upward direction. A power-driven gear wheel under the engine engages with the rack and so drives the train. With a gradient of 1 in 2, however, the use of a vertical rack was impossible on the Pilatus Railway. There would have been a risk of the gear wheel “jumping” the teeth of the rack, with a consequent headlong rush of the train to certain disaster. In the Locher system a double rack rail is used between the running rails of the track. The teeth of the rack project horizontally from either side of the central rail. In the original steam-driven carriages on the Pilatus line the underframe was carried on four wheels that were used for carrying only. They were not power-driven. The wheels were flangeless because flanges would have increased the difficulty of negotiating the sharp curves on the route. To ensure that the carriage should keep on the track, the central rail, in addition to the rack, was provided with machined surfaces on either side to serve as guides. At the lower end of the coach frame were two horizontal toothed wheels on vertical shafts, arranged one on either side of the central rail. The toothed wheels engaged with the racks and at the lower ends of the wheel shafts were steel rollers making contact with the guide surfaces. The rollers were designed also to prevent the horizontal wheels from rising ‘‘out of gear”. At the front or upper end of the coach was another pair of horizontal toothed wheels with corresponding guide rollers. These front toothed wheels engaged with the rack and were used for braking purposes. The toothed wheels at the lower end of the coach were driven by two horizontal cylinders through a crankshaft and gearing. The cylinders were supplied with steam at a pressure of 176 lb by a boiler of the locomotive type placed across the frame. This boiler arrangement was the only one feasible. It is impracticable to tilt, a locomotive boiler longitudinally at the angle imposed by an incline of 1 in 2. APPROACHING THE TERMINUS of the Pilatus line, which is at Pilatus-Kulm, 6,791 feet above sea level. At the upper terminus are two hotels. The railway track is built on a masonry wall. The gangway for use by those responsible for the maintenance of the line may be seen alongside this masonry wall. For similar reasons the seat backs and partitions were built permanently out of plumb, giving the coaches their unusual appear-ance. The coaches were divided into four compartments, apart from the boiler and driving cabin Each compartment provided accommodation for eight passengers The weight of the carriage was 10½ tons, and 176 gallons of water were carried, in addition to 2½ cwt of coal. The speed, when ascending or descending, was about 2¼ miles an hour. The braking system used was highly efficient. One brake was provided for use on the engine crankshaft and was operated by hand. The second brake was of special interest. Every motorist is familiar with the practice of descending steep hills “against compression”. A similar method was used on the Pilatus line. With steam shut off, air was drawn through the exhaust ports into the engine cylinders of the descending coach. The air was compressed, thus helping to retard the car, and was then expelled through a special regulating valve. Air when compressed becomes intensely hot, and to overcome this disadvantage the compressed air in the cylinders was cooled by water jets. The third brake on each coach operated automatically when the speed exceeded three miles an hour. It was arranged to act on a drum driven by the front pair of toothed wheels. This brake was also under the control of the front brakesman. A further safe-guard was the provision, on the car, of clips that embraced the running rails. This arrangement was provided to guard against derailment by wind. Such were the wonderful steam coaches which for nearly half a century carried tourists of all nationalities to the summit of Pilatus. During this time considerable improvements were made in details of the coach design, although the working principles of the Locher rack-rail system were preserved. Eleven different types of steam coach were evolved for use on the Pilatus Railway, and this was the first mountain line to use superheated steam and thus economize in the use of water and fuel. By the close of the summer season in 1936, exactly fifty years after the building of the line had begun, an important decision had been reached. Steam was to give place to la houille blanche (“white coal”), as the French so picturesquely describe water power. Hydro-electric power was to carry men to the mountain tops that had given it birth. Despite the change from steam to electricity, the principles of the Locher rack-rail have not been abandoned. The same double-sided horizontal rack is used that served the steam coaches in their climb up the mountain. The electric coaches are carried on four wheels and the details of the driving and braking mechanism are similar to those used on the steam cars. There is a curious similarity, too, between the early and later braking systems. On the steam carriages, the engine cylinders, pumping air, were used to provide the necessary resistance and so to serve as brakes. The electric cars use regenerative braking, in which the driving motors act as generators that supply current to the power line, and in this way provide resistance to the downward passage of the coaches. The original steam carriages and the electric cars were built in the Swiss Locomotive works at Winterthur, in Switzerland. In comfort and speed, however, no comparison can be drawn between the steam and the electrically-driven coaches. The picturesque plume of smoke heralding the approach of a steam car through the pine woods has given place to a permanent overhead cable carrying current up the mountain. There is no doubt about the efficiency of the electric drive. The cars climb to the summit in thirty-five minutes, against the seventy to eighty minutes of the steam coaches. The electric cars require no additional halts to take in water. Another advantage accruing from the absence of a boiler is the clear view that is now obtained through the lower end of the carriages. Great care has been exercised also in the design of the electric cars, so that an uninterrupted view is obtained from the sides Large glass windows are fitted and the electric cars, in addition to having luxurious interiors, are suspended on special springs to avoid jolting. The electric carriages are approximately 36 feet long and provide seating accommodation for forty passengers. The unladen weight is 9½ tons, rather less than that of a steam coach, despite the gain in speed and seating capacity. This has been achieved by the use of specially light materials in the electric carriages. The toothed driving wheels that engage with the rack are placed, as in the steam cars, at the rear end of the coach and are driven through an ingenious system of shafting and bevel gears by a pair of electric motors with a combined output of 210 horse-power. Direct current is supplied to the motors through the overhead cable at 1,550 volts, and the return is made through the rails. The direct current is taken from a special converter station supplied with alternating current at 50,000 volts from the Central Swiss Power Stations. The automatic brake, similar to that on the steam cars, acts on a drum driven by a pair of rack wheels at the upper end of the coach chassis. Only one driver is required for each electric coach, which can be driven, tram fashion, from either end. In the event of any accident to the driver a “dead-man’s handle” safety device immediately comes into operation and stops the car when ascending or descending. The railway’s ascent of Pilatus is worthy of special consideration, because every yard of the great granite wall on which it runs represents some act of heroism, some highly skilled feat of engineering, or the surmounting of a difficulty almost beyond solution by human ingenuity. The start from Alpnach is made in pleasant surroundings, among gardens and grounds well laid out with shrubs and flower beds in the midst of the little Swiss town. Only the track of the railway, with its initial slope of 1 in 3, gives an idea of the thrills ahead. At first the line wends its way through meadows and farmland dotted with chalets and cowsheds, with moss-grown roofs weighted down with large stones to prevent the wind from carrying them away. As the coach rises higher orchards give place to dense forests of beech. The sombre beech woods, perched on the steep hill side, clinging precariously to the scanty soil, form fitting portals to the grim mountain mass that rears far above them. Only half a mile from the starting point is the famous Wolfort Ravine, with its single arch stone bridge, 2,953 feet above sea level. Far below is the Bay of Alpnach on Lake Lucerne, on which a passing steamer will appear the size of a walnut shell, so great is the height. Apart from its wonderful setting astride the tree-feathered ravine, that bridge represents a marvellous feat of engineering. The great single arch, with its span of 75 feet, is built entirely of stone. The mighty wall on which the Pilatus line is laid spans the vast rift and provides a solid foundation for the triple track of gleaming steel. With falsework and timbering a temporary frame was thrown across the ravine. Then stone by stone the bridge grew together until the giant arch, as if conscious of its own strength, locked rigid upon its rock-hewn abutments. The Wolfort Bridge was by no means simple in design. Travellers across the ravine cannot have failed to notice that not only does the bridge slant steeply upwards, but it is also built on a curve. A curve at that point was necessary and the engineers decided to bend their line to the standard radius of 262 ft 5 in But Nature was not content with the ravine as a test for the skill and courage of man. A promontory of rock jutted out at the upper end of the bridge and had to be tunnelled. For a distance of 144 feet the railway builders drilled and dynamited a way through the rock. Beyond the Wolfort Bridge and its tunnel the line begins to climb the Risleten on a gradient of 1 in 2. The Risleten is an example of a “talus”, or steep slope at the base of the mountain, and it has been formed through countless ages by the washing down of rocks and debris from the heights above. Subterranean vaults and pillars and massive buttresses of solid masonry were required to render the talus safe for the track. From the top of the Risleten there opens a magnificent view of the Obwalden Valley, where run great embankments that defend the pastures from the dangerous Schlieren torrents, one of which courses down the slopes of Mount Pilatus. Next the coach traverses the Spycher Tunnels, the first 167 feet, the second 318 feet in length, blasted through the mountainside in a wild forest region. From the upper Spycher Tunnel, and still climbing, the line opens upon yet another wide view. Far below are seen most of Lake Lucerne and part of Lake Zug. Beyond are the Rigi and the range of the Albis Hills. At a distance of 2,600 yards from the lower terminus and at a height of 4,000 feet above sea level the train reaches the pleasant mountain pastures of the Aemsigenalp, where the Pilatus engineers built a pair of ingenious “crossovers” that enable the coaches ascending to pass those on the downward journey Here, too, the steam coaches used to halt and take on water. At a height of 6,200 feet above sea level, and some 4,100 yards from Alpnach, the train enters a series of tunnels. There are four of them - 144, 180, 150 and 36 feet long - cut through the solid rock that overhangs the Eselwand precipice. The track that links them is laid on a ledge blasted out of the mountainside. Drilling holes in the rock for the blasting charges was carried out from planks hung on ropes over the edge of the precipice. 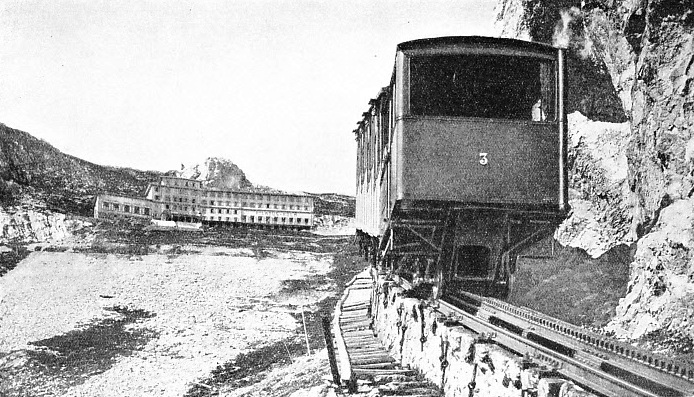 Finally, the coach hauls its way along the last steep stretch and enters the station of Pilatus-Kulm, the upper terminus of the railway. Here are two hotels, cradled between the Esel and the Tomlishorn; 5,344 feet below are Lucerne, with its lake, and all Central Switzerland - sometimes providing a picture for the memory, sometimes covered by a sea of cloud. NEW ELECTRIC COACH for the Pilatus Railway. Similar in general design to that of the steam cars formerly used, the electric coaches represent the best of modern coachwork. Larger windows give a better view of the magnificent scenery. Each coach is about 36 feet long, has accommodation for forty passengers and weighs 9½ tons unladen. Electric motors of 210 horse-power at the rear of the coach operate the toothed driving wheels that engage with the rack. Click here to see the illustrations in the photogravure supplement.